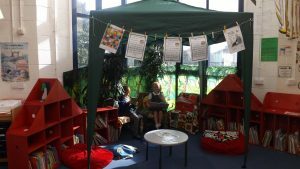 Longmoor Community Primary School | Our Amazing Library! We were amazed today to see that our library area has changed into an exciting jungle reading area, to link with our topic about animals! We are very excited and can’t wait to read lots of interesting books about animals here. We are looking at fiction and non-fiction books, as we are moving onto non-fiction work next week.